London: The Architectural Press. Very Good. 1925. Hardcover. The Fourth Work in the "At A Glance" Series; "A Pictorial Record of the Evolution of The Sailing Ship From the Earliest Times until Today". Black and white photos of ships pasted in at endpapers, a few pencil markings, green boards with black stamping show some light soiling, darkened, chipped spine, else about very good. .
1926. 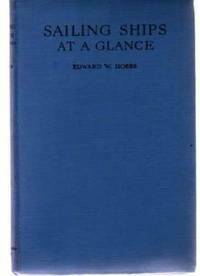 HOBBS, Edward W. SAILING SHIPS AT A GLANCE. Introduction by L.G. Carr Laughton. With 150 Illustrations by the Author. NY: G.P. Putnam's Sons, . 8vo., gilt-stamped black cloth in dust jacket. 221 pages. First Edition. Very Good (contents clean & tight, ink name on front endpaper with very tiny Boston bookseller's label); minor wear (some tanning) d/j. $20.00. New York: G.P. Putnam's Sons, 1926 221 pages with 150 illustrations by the author. Bound in original black cloth with lettering and illustration in gilt. Two corners lightly bumped. Corner crease to front endpaper. Mild foxing to page edges. A very good copy.. First US edition, first printing. Hardcover. Condition: Good condition; prior owner rubber stampings in tattered d.j. London: The Architectural Press, 1925. The fourth work in the 'At A Glance' series with an introduction by L.G.Carr Laughton. Good, clean copy in card covers showing light shelfwear - 114 pages. Prompt dispatch. . Stiff Card Covers. Good. 8vo - over 7¾" - 9¾" tall. The Architectural Press 1925 Hardcover. Good.